Soups are a constant standby in my house. My husband would happily eat soup 365 days out of the year, so I try to cook at least one soup for dinner each week. It's a great way to experiment with new flavors and ingredients once you have a handle on the basics of seasoning and constructing a soup. This recipe sneaks in that leafy green superfood we're all supposed to be eating these days: kale. 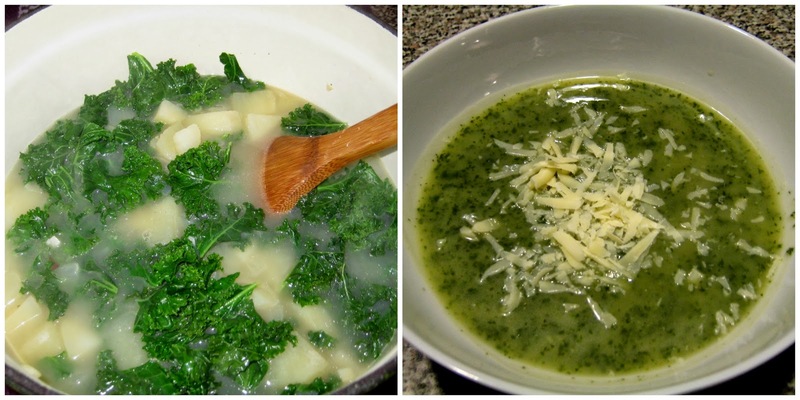 Unlike spinach, I don't like eating kale raw or just simply sauteed as a side dish, so soups are a perfect way for me to work it into my meals. This soup is creamy without actually having to add cream, with the white beans and potatoes adding a heartiness that's fantastic for chilly winter nights. You can serve it pureed (the way I did) or leave it chunky if that texture is something you enjoy more. What is your favorite go-to soup recipe? I've also found that flavorful soups are a great way to get my daughter (she's 20 months old) to eat more protein and veggies, which is a definite win in our house! Lightly steam the kale and set aside. Don’t cook it with the potatoes; otherwise it will make the kale taste too bitter and strong. Heat butter in a large dutch oven or pot. Add in the onion and sauté until soft and golden, then add in the garlic and cook for another minute. Season with salt and pepper. Add in the potatoes, beans and chicken stock. Bring to a boil, then reduce to a simmer and cook until the potatoes are tender (about 10 minutes). Add in the kale and cayenne, stirring to combine. Blend the soup until smooth with an immersion blender or puree it in batches in a traditional blender. Taste and add additional seasonings if needed.